A fine unbeaten 174-run partnership between George Hirst and Pete Hardisty guided Birstwith to a comfortable triumph over reigning Theakston Nidderdale League champions Ouseburn. A big total did not look to be on the cards for the visitors as a pair of wickets apiece for Jamie Bryant, Ben Mackrill and Jamie Bullivant left them on 103-6. That was until the pair’s impressive stand for the seventh wicket helped raise 277/6, Hirst hitting 83 and Hardisty 78. Chris Morrison led the Ouseburn reply with 75 not out, but they couldn’t keep up with the required run-rate and eventually finished well short on 190/8. Hardisty, Nick Wain and Craig Robinson each ended the match with two dismissals to their names. Elsewhere in Division One, top-of-the-table Burton Leonard joined Birstwith in making it two wins from their opening two fixtures when they overcame Spofforth by three wickets. The hosts were skittled for just 42 last time out, and although they produced a much-improved display with the bat this time around, they could only muster 133. Devon Nightingale’s 23 was the highlight of their innings as Sam Crompton helped himself to 4-42. Burton made hard work of knocking of the runs needed for victory, but eventually found their way to 137/7, Dan Thirkell top scoring with 32. Darley also secured a second win of the campaign when they beat Masham on home soil. Andrew Smith (54), Nathan Kleinig (53) and skipper Phil Newton (44) all showed good form with the bat as Masham closed on 230/7 from their 45 overs, Joe Furniss taking 3-34. Gary Muff’s 67, an unbeaten 52 from Jamie Sands and Furniss’ 44 then proved enough to help the hosts to 231/4. A stunning century from Knaresborough Forest opener Aaron Brunner wasn’t enough to help his side chase down Goldsborough’s 287/8. The Australian smashed 13 fours and four sixes in his 109-ball knock of 120, while Daniel Kiernan chipped in with 56 and Matthew Parker 31. Forest looked well set at 198-2 and 226-3, but none of their last seven batsmen made it into double figures and they eventually ended up 12 runs short of their victory target on 276/9. Jarrod MacPhee was the star of the Goldsborough attack with 4-57. Earlier, the home side had racked up 287/8, Damon Ive (84), Andy Ward (67), Gavin Hodson (53) all making half-centuries, while Jarrod McPhee contributed with 45. Shane Jarvis claimed 3-54 for the visitors. 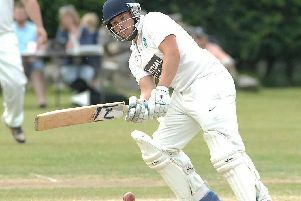 Helperby got off the mark for the season with a five-wicket success over Hampsthwaite. Richard Barratt (63) was the only home player to make any real impression with the bat as Sam Dabin’s troops made their way to 163/7, Luis Rees-Hughes returning figures of 3-35. Helperby’s reply was led by 49 from Dylan Steyn, the homesters sealing their success with more than four overs to spare. West Tanfield’s first innings effort of 181/8 proved sufficient to see off Alne, the Sleningford outfit finishing up winners by a 55-run margin. Adam Hodgkinson’s 57 not out proved to be the cornerstone of the victors’ score, Tony Raper and Toby Strike each bagging three-wicket hauls for Tanfield. The men from the Magic Circle’s response never really got going as Josh Barrett (5-21) and Angus Shaw (4-27) wreaked havoc and only Alex Buteux (26) showed any real fluency with the willow. In Division Two, Paul Follett plundered 112 not out as Newby Hall cruised to victory over Pateley Bridge. Captain Ady Allen also hit 73 in a whopping opening stand of 190, Hall closing on 244/3. Thomas Simpson made 72 as Bridge replied, but they could only make it to 173, overseas ace Gerhard Rautenbach snaring a trio of victims. Openers Stephen Ellison (63) and Chris Eckford (62) put on 125 for the first wicket as Dacre Banks edged to a five-run win over Scotton. The visitors chalked up 227/4, and not to be outdone, Scotton’s opening pair William Cunningham (104) and Sam Halliday (63) got their side off to a flying start, making 166 between them. The runs tailed off after their departure, however, and they eventually ended up just missing out on 222/7. League leaders Markington were dismissed for 151 in 34 overs, but their efforts proved more than enough to see of the challenge of Bishop Thornton. Dave Askew (37) compiled the only real innings of any note as Rich Priest finished with fabulous figures of 4-10 with the ball. In reply, Matty Bell’s 22 was the best Bishop Thornton had to offer as just three batsmen made double figures. They were eventually all out for 95, Graham Bassitt producing a devastating spell of 4-18 and Askew grabbing 3-26. A half-century from Jason Chyer laid the foundation for Burnt Yates’ 30-run triumph over Ripley. The wicketkeeper-batsman’s 76 helped the away side post 223/8, and Ripley were all out for 193 batting second. Michael Sacchetta struck 84 and Ian Robinson 44 in the hosts’ reply, but their efforts proved to be in vain, as Carl Brockhill and Chris Triggs both snaffled three-wicket hauls. A knock of 74 from Oliver Simenacz helped Studley Royal chase down Blubberhouses’ 126/8 with ease. Earlier Tom Hixon and Wayne Gosling had shared half a dozen wickets as the away team struggled to find the boundary, Bash Khan their top scorer with 28. Raskelf’s Jon Henley and Barry Petty claimed three wickets each as Wath & Melmerby were blown away for just 97. Rob Sigsworth (35 not out) and Barry Milburn (32) saw the visitors home at 99/3 inside 17 overs.